Do you need to restore an iTunes backup to your iPhone (such as the new iPhone X or iPhone 8), but only one specific set of data? Do you wish that you could extract only your WhatsApp messages and restore them to your iPhone without having to restore everything else? This may seem like a dream, but actually it's completely possible. You just need the right tools. If you use iTunes to restore your iTunes backup, you can't restore your WhatsApp messages only. Because of Apple's many limitations, backups are "all or nothing." 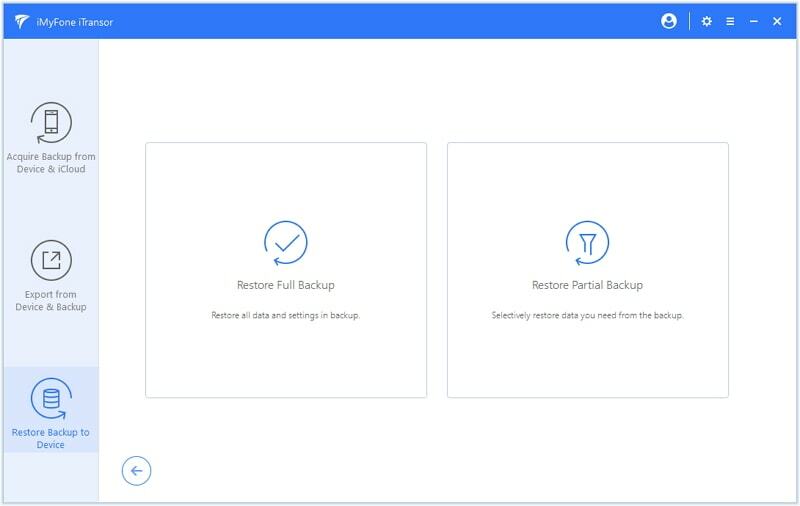 You either restore the backup entirely, or you restore nothing—you can't pick and choose your data. This is inconvenient and annoying, but there's a tool that can perfectly fix this issue. Restore not only WhatsApp messages, but also your audio messages, photos, videos, and other attachments without having to do a full restore. 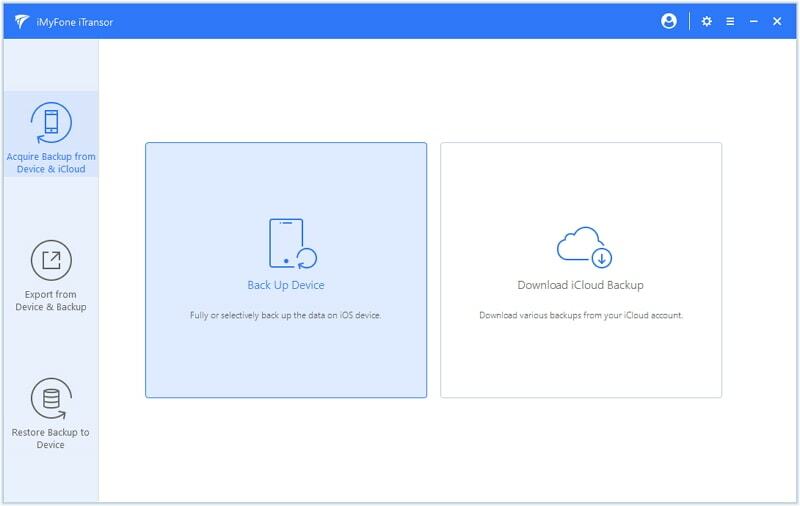 Extract data from your backups easily and save them on your computer for your view. 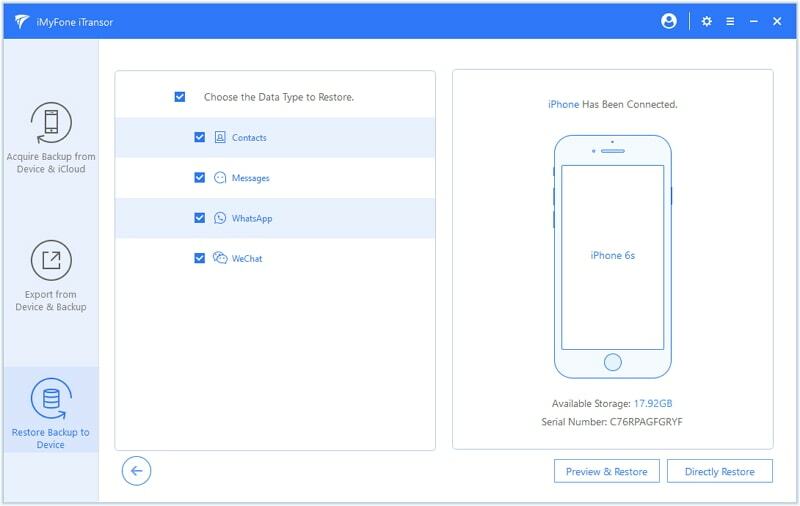 Restore many other data types from backups to iOS device. 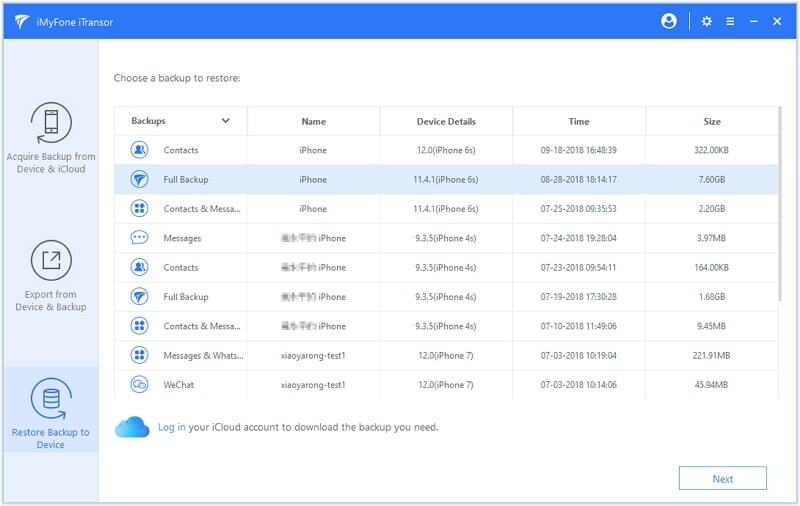 You can restore only messages from iTunes backup, or restore WeChat messages to your iPhone X. It supports restoring WhatsApp messages. More data types will be added in the future as well. iTransor supports to back up iPhone X, iPhone 8, and older iPhones as well, without overwriting old backups on computer. Step 1. Download and install iTransor to your computer and launch it. Make sure that your iPhone is connected with its USB cable. You will see that iMyFone iTransor has three main functions on the whole. Step 2. Click where it says Restore Backup to Device on the left sidebar and iMyFone iTransor will show you all the iTunes backups you have. Step 3. Choose the backup that you want to restore WhatsApp messages from and click Next. You can see that this program offers two options – restore the whole backup or partial backup. Click Restore Partial Backup since you want to restore only WhatsApp messages from iTunes backup. Step 4. Click Restore Partial Backup and the program will show you the notices before restoring. Check WhatsApp under the heading Third-Party IM App. If you need, you can check Message, Contacts and WeChat, of course. 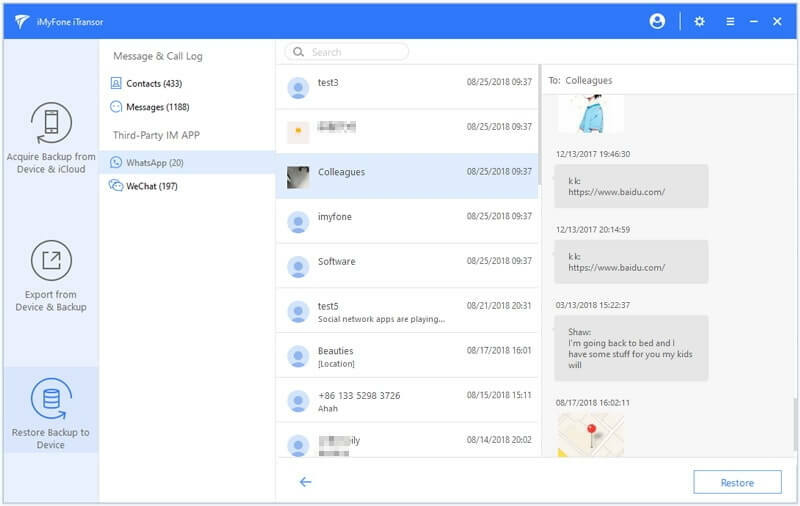 iMyFone iTransor supports more types of data in near future. Then click Preview & Restore or Directly Restore. Step 6. 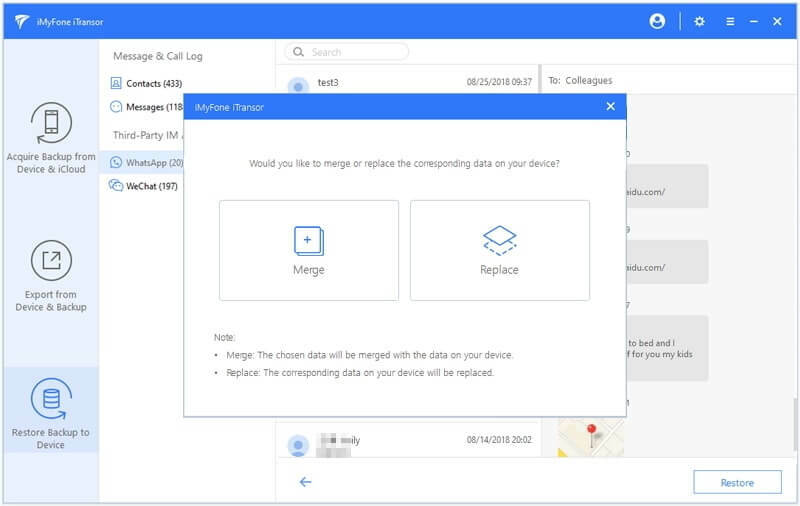 Preview and select what data you want to restore. Here in this case, be sure to check WhatsApp only when you choose what data type to restore if you want to restore WhatsApp messages only from iTunes backup.. Step 7. Click Merge & Replace or Fully Replace and wait the program to finish the rest things. You can refer to this link to learn more information on how to back up only WhatsApp messages from your new iPhone X or iPhone 8. It's certainly possible to restore only your WhatsApp messages from a backup. This will save your time and effort, but remember that you need a special tool like iMyFone iTransor to do this. Besides, remember that the program is totally free to back up the data on your iPhone. Try it now!